The EUR/USD is logging solid gains so far today as we witness broad-based profit taking the Dollar. Gold is back above $1100/oz and the EUR/GBP has popped towards .90, indicating relative strength in the Euro. The Euro’s strength comes despite yesterday’s weaker than expected French Consumer Spending data. Investors are instead focusing on weaker than expected U.S. New Home Sales, Revised UoM Consumer Sentiment, and Personal Spending. The pullback in U.S. economic data has given investors the opportunity to lock in recent Dollar gains as confidence in the U.S. economy wanes. That being said, investors will receive more key U.S. data today in the form of Durable Goods Orders and weekly Unemployment Claims. If today’s U.S. econ data also print below analyst expectations this could fuel the Dollar present pullback and allow the EUR/USD to hop back above 12/18 highs. Meanwhile, the EU is on holiday for the rest of the week for Christmas, and trading should die down as the U.S. trading session wears on. Technically speaking, the EUR/USD faces technical barriers in the form of our 3rd and 4th tier downtrend lines along with the psychological 1.45 level. Bulls will be looking to get the EUR/USD back above our 2nd tier uptrend line since it runs through July lows. That being said, the EUR/USD could still be in the midst of a more extensive downturn if the currency pair doesn’t surmount some topside technicals soon. The story will remain the performance of America’s economy and whether fundamentals can continue their impressive recovery over the near-term. As for the downside, the EUR/USD has technical cushions in the form of December and September lows along with the highly psychological 1.40 area should conditions deteriorate. The Cable is stabilizing today as investors take profits in the Dollar across the board. However, the Pound is exhibiting a relative weakness, as highlighted by a pop in the EUR/GBP. Weakness in the Pound likely stems from yesterday’s BoE Meeting Minutes, which indicated that the central bank is still cautious due to the disconcerting decline in the money supply. However, the BoE will continue to monitor the effectiveness of its current QE measures, meaning any action may be delayed until February’s meeting. On a positive note, all 9 BoE members voted in unison to keep the central bank’s monetary policy unchanged. Hence, all BoE members are on the same page with a wait-and-see approach. Meanwhile, the Cable will likely follow any broad-based moves in the Dollar due to the lack of UK economic data until next week’s Nationwide HPI release. That being said, investors should monitor the Greenback’s reaction to today’s U.S. Unemployment Claims and Durable Goods Orders releases. Should today’s U.S. econ data echo yesterday’s negative sentiment then investors may continue to lock-in gains on the Dollar, a positive catalyst for the Cable. On the other hand, should U.S. data print positively, investors may snap up the Dollar again and leave the Cable around December lows. However, activity should gradually cool down as the session progresses as investors check out for the Christmas holiday. Technically speaking, the Cable’s large pullback this month has sent the currency pair below some key technical levels. Hence, it’s possible the Cable could be entering a more protracted downturn. The Cable has now dropped below our 2nd tier uptrend line with our 1st tier uptrend waiting far below (Off Chart). That being said, the fact we are now using March lows, or the 1.40 area, to create uptrend lines gives investors an idea of the extent of the damage inflicted by the Cable’s December pullback. Meanwhile, it will be interesting to see if the Cable can add onto intraday gains and gain some topside separation from 1.60. If not, the Cable does have some technical supports in the form of September and October lows. 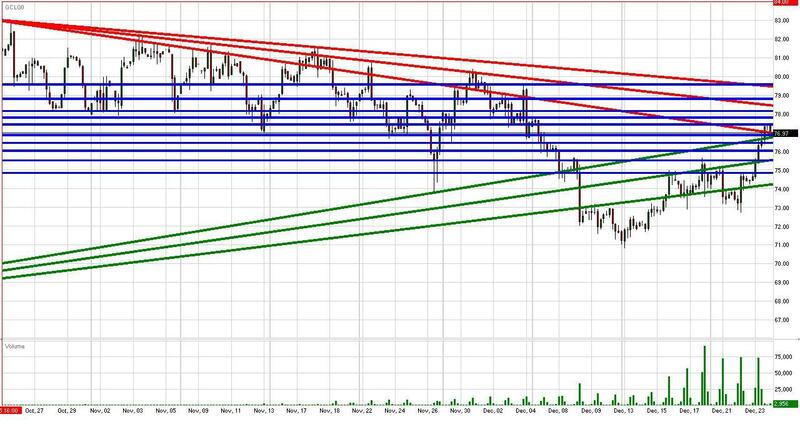 As for the topside, the Cable faces multiple downtrend lines along with 12/18 and 12/16 highs. The USD/JPY’s recent rally seems to be topping out as investors lock-in profits on the Dollar. Today’s weakness in the USD/JPY comes despite a reiteration from the BoJ that the central bank is intent on fighting deflation, implying an accommodative monetary policy for the foreseeable future. Such a hawkish monetary stance is positive news for the USD/JPY so long as U.S. economic data continues to recover over the near-term. That being said, yesterday’s U.S. data set was discouraging, particularly the pullback in New Home Sales. Yesterday’s negative U.S. economic data is the culprit behind present profit-taking in the Dollar, and it will be interesting to see how the Greenback reactions to today’s releases. Today the U.S. will print weekly Unemployment Claims and Durable Goods Orders. The U.S. DGO data could be a market mover for the USD/JPY since Japan’s economy is dependent upon export demand to the U.S. Japan will join the data wire with Household Spending and Tokyo Core CPI during the evening trading session. Investors will be honing in on Japan’s Tokyo CPI data since a weak number could support the BoJ’s recent hawkish monetary policy statements. Meanwhile, activity should cool down as the trading session progresses as investors check out for the Christmas holiday. Technically speaking, the USD/JPY’s movement above our 4th tier downtrend line is an encouraging development since it runs through 8/13 levels, or the psychological 95 area. Meanwhile, the USD/JPY does face topside technical barriers in the form of our 5th tier downtrend line, 10/26 highs, and 9/21 highs. Furthermore, the psychological 90 area could still play a role considering how tough the trading zone has been to overcome in the past. As for the downside, the USD/JPY has multiple uptrend lines serving as technical cushions along with 12/21, 12/18, and 12/14 lows. Meanwhile, the psychological 90 level should serve as a technical cushion should it be tested. Gold has popped back above the highly psychological $1100/oz level, which could turn out to be a hard fought battle since the area does carry some extra psychological weight. Gold is finding its strength in Dollar weakness as we witness pops and consolidation in the EUR/USD, AUD/USD, and GBP/USD. The Greenback is pulling back across the board in reaction to yesterday’s disappointing U.S. data set, particularly the dip in New Home Sales. FX investors will get another dose of data today in the form of weekly Unemployment Claims and Durable Goods Orders. Should today’s data set reflect yesterday’s weakness the Dollar could experience further selling pressure as investors lock in profits ahead of Christmas, a positive catalyst for gold. That being said, activity should wind down as the session progresses with investors checking out for the holiday. Hence, gold could continue to float within striking difference of $1100/oz as investors close of shop for next week, which will also be shortened by the New Year holiday. Crude futures posted solid gains yesterday, popping above their psychological $75/bbl level after crude inventories came in well shy of analyst expectations. The surprise drop in inventories coupled with a pullback in the Dollar allowed crude futures to piece together a positive session, further distancing themselves from December lows and the psychological $70/bbl level. Additionally, OPEC’s decision to keep production unchanged allows investors to price crude futures more on immediate-term data. Meanwhile, the U.S. will release weekly Unemployment Claims and Durable Goods Orders data. It will be interesting to see how crude futures react should today’s data exceed analyst expectations. Positive U.S. econ data could buoy the Dollar and encourage more Greenback purchases, a negative catalyst for crude futures. On the other hand, positive employment and consumption data is encouraging for crude’s aggregate demand, a positive catalyst for crude. Therefore, crude’s reaction to today’s data points could be telling in regards to whether the futures are following the Dollar or U.S. econ data. Activity should cool down as the session progresses as investors check out for the Christmas holiday. Therefore, crude futures could stay within the $75/bbl-$80/bbl trading range for the time being. Technically speaking, crude futures have multiple uptrend lines serving as technical cushions along with 12/23 and 12/22. Additionally, the psychological $75/bbl level could serve as a technical cushion should it be tested. As for the topside, crude futures still face multiple downtrend lines along with December highs. Furthermore, the psychological $80/bbl area could serve as a solid technical barrier. Meanwhile, a pop above our 3rd tier downtrend line could yield a near-term run towards $82/bbl since our 3rd tier runs through November highs. The S&P futures continue to march higher despite setbacks in econ data points, most notably yesterday’s discouraging New Home Sales figure. The slowdown in New Home Sales has negated this week’s positive Existing Home Sales data. In addition to yesterday’s negative housing number, the U.S. also reported disappointing Personal Spending and UoM data. However, investors shrugged off the setback and instead sent the S&P futures to new 2009 highs. The positive performance of U.S. equities likely resulted from the pullback in the Dollar following recent waves of strength. Meanwhile, investors will be looking forward to today’s weekly Unemployment Claims and Durable Goods Orders data releases. Should today’s data print better than yesterday’s, we could witness strength in the Dollar. On the other hand, more negative econ data could give investors an excuse to lock in more Dollar gains. The correlation between equities and the Dollar is a bite cloudy these days as it seems equities are benefitting no matter which way the Greenback moves. However, we believe a more reliable correlative pattern could come into effect once the holidays are over. That being said, activity should cool down as the trading session progresses as investors shut down for the Christmas holiday. Economic data will return on Tuesday with the release of CB Consumer Confidence.